The countdown to Cunard Line’s long awaited transatlantic voyage is well and truly underway, with July 4 marking exactly one year before the RMS Queen Mary II will begin her journey from Liverpool to New York City. US Independence Day 2015 will also mark 175 years since Cunard’s first ship, RMS Britannia set sail on the first passenger and mail steamship transatlantic voyage the world had ever seen. While the maiden 1840 voyage led to decades of successful passages, Liverpool transatlantic services were suspended in 1967 when the line left its majestic Pier Head HQ for the convenience of Southampton. As such, the upcoming Queen Mary II Liverpool transatlantic crossing will be the first in almost half a century. Plans are already underway to mark the momentous occasion, with Cunard’s company chiefs referring to Liverpool as the “spiritual home” of the British-American owned line. 175th anniversary celebrations will kick off on the Mersey which will play host to the Three Queens One Magnificent City event at Pier Head. The festivities will see all three members of the Cunard fleet descend upon Liverpool’s famous river in a move that the company hopes will match the excitement of the 1840 maiden voyage. “We hope that the visit of the three Queens will at least match that and be talked about in generations to come” said Struthers. Locals keen to jump on-board! 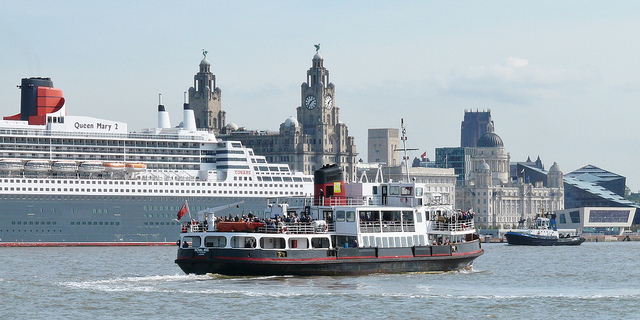 Locals were quick to show their enthusiasm for the sentimental Queen Mary II voyage, with the first round of 250 allocated Liverpool Cruise Terminal departure berths selling out almost instantaneously. While the line did offer an additional 150 places, disappointed locals who missed out on securing a place are still calling on the line to open up more of its 2600 person capacity to Liverpool passengers. If you want experience the superior service, unparalleled luxury and timeless grandeur of a Cunard Line cruise, take a look at some of the amazing Cunard deals from Cruise 1st. Alternatively, you can give our friendly sales team a call on 0808 274 6777.